“Every once in a while, we are privileged with the gift of holding in our hands truly unique and emotionally riveting books which have the capacity to leave permanent footprints etched in the heart. Mel Tregonning’s Small Things is, undeniably, one of those books. While Tregonning’s untimely passing in 2014 has resulted in her being unable to physically witness the impact that her work has had on so many lives, it is safe to say that the legacy she has left behind in Small Things will continue to inspire and promote awareness for years to come…. Sadly, Tregonning was unable to see her project to its entirety, and, therefore, the final illustrations of the book were completed by renowned illustrator Shaun Tan who has forever redefined the genre of children’s literature with his creative, wordless vision and masterful life-like illustrations through such influential books as The Arrival. 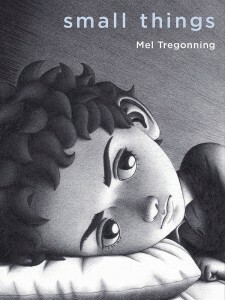 The similarities between Tregonning’s and Tan’s work are uncanny, and their mutual use of black and white and intricate shading techniques results in an extraordinarily realistic and haunting visual depiction of the actions and emotions of their characters. While evidently unforeseen, this chance merger of two such prolific illustrators of our time has resulted in a wordless masterpiece that, like The Arrival, effortlessly taps into the rawness of the human experience. In Small Things, the author seems to speak to us from beyond the pages with a poignant reminder that no one is ever truly alone in their internal battles. Furthermore, Tregonning’s young protagonist acts as an example of the newfound hope and healing that can progressively emerge from confiding in others during life’s more challenging phases. Perhaps what makes this book most appealing is its relatability. Readers of all ages will be able to associate with the examples of daily stresses and worries that make us vulnerable and, at times, chip away at the soul, leaving temporary cracks for the light to escape. This beautifully depicted textless narrative which effectively honours not only the life of Tregonning, herself, but also the lives of all those who have been impacted by struggles with mental health, is a must-have, one-of-a-kind addition to every school library and home collection. —Christina Quintiliani is an Ontario Certified Teacher and Ph.D. Candidate at the Faculty of Education, Brock University, St. Catharines, ON., where she is researching children’s literature. A Starred Review for Small Things from School Library Journal! —Rachel Forbes, Oakville Public Library, Ont.